Unintentional drowning is the leading cause of injury-related death for children from 1 to 4, the second-leading cause of unintentional death for ages 5-9, and number three for ages 10-14. More kids under 5 drown in Florida than in any other state. The Sunshine State ranks number two when it comes to drowning deaths for kids under 14. In the week following July Fourth, there were two fatal drownings in Central Florida and a third serious injury drowning. In both wrongful death and serious injury drowning cases, substantial compensation is usually available. However, it takes an experienced attorney to win these cases. They are quite complex and the Florida insurance company has a very good potential defense. To establish legal responsibility in landowner liability cases, like swimming pool drownings and slip-and-fall cases, Florida law basically uses the old common law classification system. By definition, invitees are individuals who respond to the owner’s express (“come over for a pool party”) or implied (an “open for business” sign) invitation to be on the land. An invitee also provides a benefit to the owner. That benefit could be economic or noneconomic. Furthermore, money does not need to change hands. Window-shoppers are invitees even if they do not buy anything. So, the invitee designation applies to most swimming pool drowning victims in Florida. They could be at hotel pools, apartment pools, or backyard pools. If the victim is an invitee, the owner has a duty of reasonable care. The owner also has a duty to regularly inspect the property and make it as safe as possible for all invitees. Every barrier must be unclimbable and at least four feet high. Failure to adhere to these standards creates a presumption of negligence, according to Florida’s negligence per se doctrine. Different rule apply for public and semi-public pools, like community pools. These places usually need to have specific lifesaving equipment within easy reach and close to the water’s edge. Again, failure to abide by these standards is evidence of negligence. 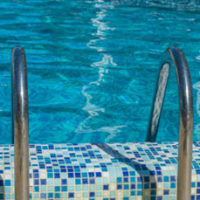 Damages in a swimming pool drowning case usually include compensation for both economic damages, such as medical bills, and noneconomic damages, such as pain and suffering. So, the victim must be able to see, read, and understand such a warning sign. If all three elements are not present, the victim arguably did not voluntarily assume a known risk. The victim may have known that swimming was not entirely safe, but legally, that’s not the same thing. A few moments under the water can cause permanent injury or even death. For a free consultation with an experienced personal injury lawyer in Brandon, contact Reed & Reed. We have four area offices (St. Petersburg, Lakeland, Tampa, and Clearwater).